The main color, and if there is a secondary color, together define the color tone, however the strength of color is defined by the intensity level. 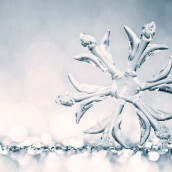 The intensity level can be anywhere from a very soft shade to a very strong shade, and the stronger the shade the more valuable the diamond is. 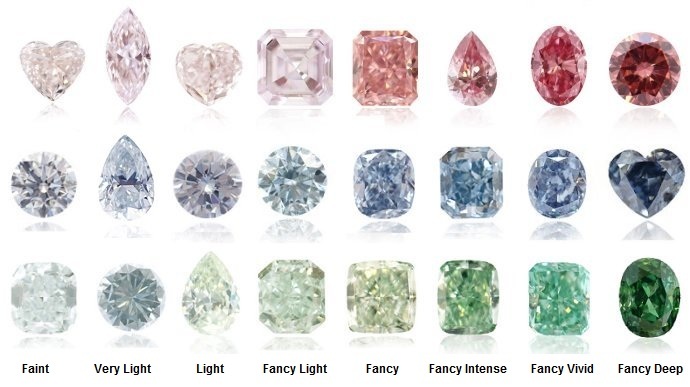 For example, the following image depicts the full scale of color intensity in Pink, Blue, and Green color Diamonds. It is clearly shown that the intensity scale begins with very soft colors and progressively displays a richer color stone. However, it is important to understand that not every diamond color appears in all intensity levels. For example, Orange diamonds cannot be found in Faint, Very Light, or Light intensities. Only Fancy Light, Fancy, Fancy Intense, Fancy Vivid, and Fancy Deep. 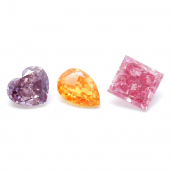 The GIA also defines how well the color and intensity is distributed throughout the stone. A diamond certificate will specify 'even' or 'uneven' according to the percentage of the color distribution. 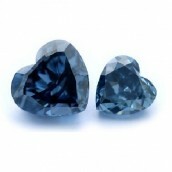 The intensity of the color has a direct affect on the value of the stone. For example a Blue diamond or a Pink diamond, which are of the rarest in the fancy colored diamond family, are quite costly and difficult to find. However, there is a significant difference between a Fancy Light Blue and a Fancy Vivid Blue or a Fancy Light Pink and a Fancy Intense Pink. Since there is such a wide range of colored diamonds, even stones of the same intensity can look quite different from one another. At Leibish & Co., the intensity of each diamond is graded on a scale of 1-10. The 1-10 scale breaks down different stones of the same intensity grade between a weaker or stronger color. A ‘Fancy Intense Pink' diamond with a 1-3 grade is a very weak ‘Fancy Intense Pink’ and actually borders a ‘Fancy Pink.’ A ‘Fancy Intense Pink’ diamond with a 8-10 has a very strong color and actually borders a ‘Fancy Vivid Pink’ diamond. 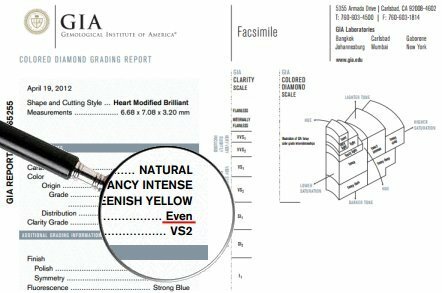 Therefore, it is actually quite common to see two diamonds of the same intensity grade where one looks as if the color is more intense than in the other. 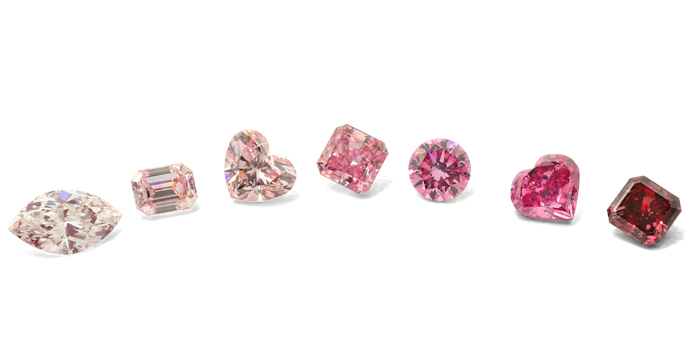 The image above depicts four diamonds all graded by GIA as 'Fancy Intense Pink' with different strengths of the same intensity grade (and color tone) between the stones. 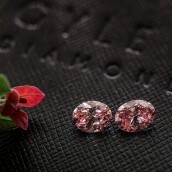 Exactly what color intensity a diamond will have will not be able to be determined from the rough stone. 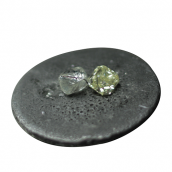 However, the greater the color intensity of the rough, the greater the intensity of the polished diamond will be. How intense the color will be is also greatly affected by the diamond cut and shape of the stone. Also, the way colorless stones are being cut (Brilliant cut) is different from how Fancy Color Diamonds are cut (Modified). The origin of the diamond is also another factor that affects the color intensity. Different diamond mines produce different shades or tones of colors. For example, a Pink diamond found in India or South Africa can’t compare to a Pink diamond found from the Argyle diamond mine in Australia.